Hey oh! I just got my boat and I'm doing some inventory on what needs replacing and what can do for now. The vessel I bought was missing the pulley sheave on the mast and the jib halyard. It'll be some time before I can get it out on the water so in the mean time I'm seeing what i can get ready and or fix before the first trip out. I thought since the sheaves on the cheek pulley and the jib halyard are missing there is no harm in trying to make some. The obvious question is how do you replace the sheave if it's riveted within the pulley. I'm making a two piece sheave. If this was something that required smooth constant rotation I wouldn't even consider this however since these parts after pulled tight will stay stationary and replacing them is not a small outlay of cash I'm going to give this a try. Here is the rendering. 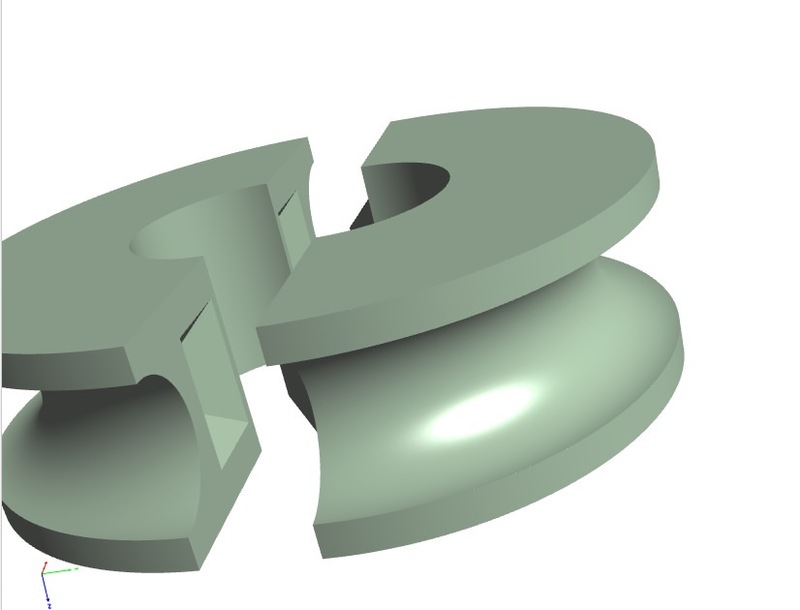 It's a two piece sheave with alignment protrusions and corresponding indent on the opposing piece. Inner diameter of the sheave is larger than the 9.5 mm pin the sheave rotates around to allow for a 1/32"(0.65mm) bearing made from rigid Teflon(PTFE) tubing. Plastic will be PVA. Once the bearing is sized and minor filing and finish work is done on the sheave halves I'll test one one to see how good the fit is and whether I need to change the dimensions of the rendering. The two pieces with be glued together using epoxy or gorilla glue. I'll report back its durability and fitness for purpose. It should be getting off the printer atm. The finished sheave. I went out to the boat and test fit. 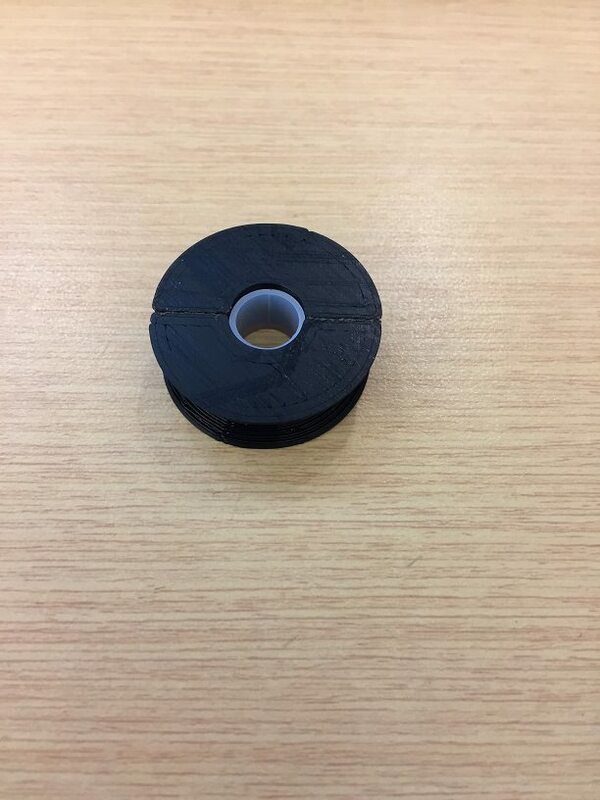 The 3d printer is close but edges and the base are not quite perfect because the printhead pushed against the filament to ensure proper adhesion to the print bed. I finished installing the sheaves. Here they are setting up for the weekend. 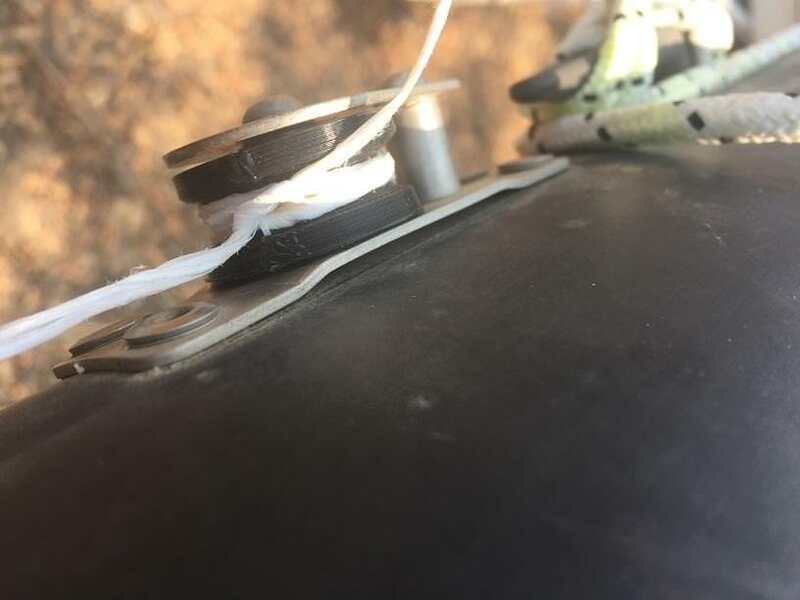 I wrapped the pulleys in bailing twine to make sure they would be nice and snug. I also cut from some ziplock bags little protectors so any extra epoxy wouldn't stick to the metal. I'm going to hoist the mast and the jib to see how it works out. 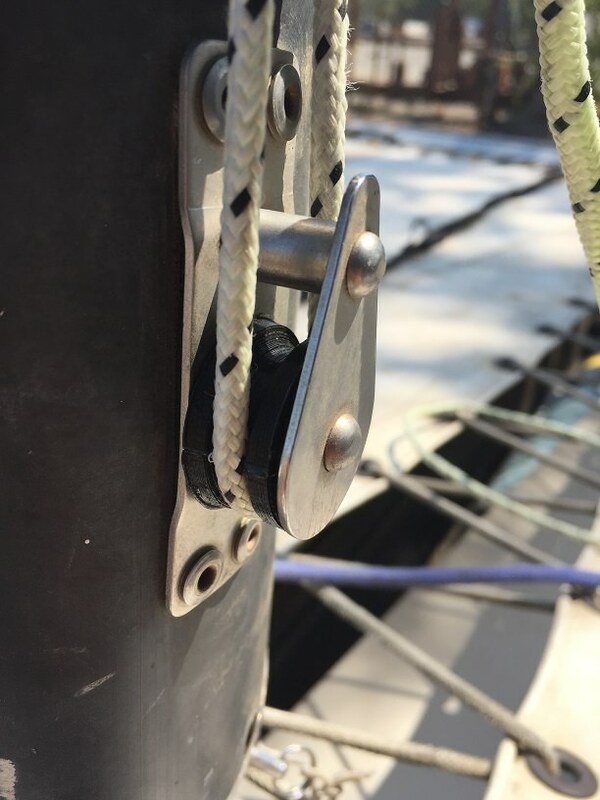 The cheek pulley was a bit wider than the jib halyard pulley so I added 2 mm width on each side of the groove to fill the space on the block. The pulley we sliding nice when I wrapped them with the twine but I suspect I may need to add a little graphite until the PTFE tube bushing breaks in a little. Back after raising the mast and tensioning the jib halyard. The cheek block was nice and smooth. The halyard block was a little less so because it was hard to get the pulley assembled without making a bit of a mess with the epoxy. Once it loads with the running rigging however it turns without issue. Both sheaves didn't break in half so that's positive. In the picture below the jib is fully rigged and the line at full tension. New lines on their way for the main and jib halyards.